Spring daffodils and hyacinth are lovely, but for showing off and touching hearts, it’s tulips that do the trick. A couple of years ago I happened on the Skagit Valley Tulip Festival while on a research trip – it’s held in April in northwest Washington State and lasts about a month, depending on how Mother Nature feels about sparking the hundreds of acres of blooms. A native flowering plant of central Asia, tulips were introduced to Western Europe and the Netherlands in the 17th century by Carolus Clusius, a Viennese biologist. Tulips grew in popularity, sparking a huge run-up in the price of bulbs. 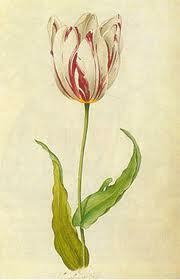 It wasn’t long before Tulipmania swept Holland and Europe, driving prices to astronomical levels. In the months of late 1636 to early 1637, there was a complete frenzy in the trading of tulip bulbs that created what some economists say is the first documented economic bubble. Ordinary working folks made huge amounts of money during the period. People started selling their businesses, family homes, farm animals and furnishings to buy and trade bulbs. Over-supply and market reluctance led to lower prices and finally a quick price collapse. Traders went bankrupt while many people lost their life savings. Creative history writer and best selling author Mike Dash wrote a book about the frenzy that paints a picture of a society gone tulip crazy and the consequences of this passion. Dash’s book – The Story of the World’s Most Coveted Flower and the Extraordinary Passions It Aroused – is available online at http://www.amazon.com/. ﻿﻿﻿﻿﻿﻿﻿﻿ Dash says the tulip mania was rooted in one simple reality: the flowers were absolutely beautiful, much more so than the relatively plain varieties available today. The most valuable flowers of the period possessed petals adorned with vivid and intricately-patterned flames of color which have not been matched before or since, and that made them irresistible. Whether today’s varieties are plain or potent, you can give yourself over to their allure and take in the grand wash of tulips, along with daffodils and irises, at the Skagit Valley Tulip Festival. Tour the fields by foot, bicycle, car, tour bus or seaplane. The month-long events – from street festivals to art shows to children’s field trips – draw nearly a million people to the valley each spring. 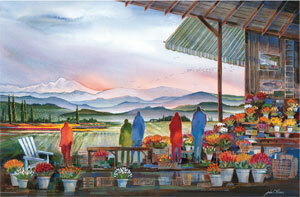 Who’s behind the Skagit Valley tulips? Roozengaarde. A bulb and flower company. It was established in 1985 by the Roozen family, who own the Washington Bulb Company. The family’s business of growing tulips, daffodils and irises is the largest in the world, covering Skagit Valley with more than 1,200 acres of field blooms and 15 acres of greenhouses. To enjoy the celebration of spring and a sailing day trip that includes a bus tour of the tulip fields of the Skagit Valley Tulip Festival, contact Victoria Express. The excursion leaves from Port Angeles Harbor and sails to the historic La Conner waterfront. $98.00 U.S. per person round trip. The 2011 Tulip Festival Day Cruise is Saturday April 16th. If you got tulips, please send photos of this year’s floral spectacle. We’ll share them with Word Garden readers. Until then, thanks and we’ll see you in the garden.